One of my go to side dishes this time of year is Yamagata Dashi, a classic kyōdo ryōri (regional dish) from where my family is from. I didn’t eat it growing up, and only came upon it once I lived in Japan. It’s the perfect dish for summer as the vegetables for Yamagata Dashi are at the peak of their season. Yamagata Dashi smells like you are in the garden. It has a crunchy texture and depending on how much nattō kombu and okra you use, it can be very slippery. I love the aromatics from the shiso and myōga, the crunch from the cucumbers, and it took a while for me to get used to eating raw eggplant, but I love it now. The main ingredients are cucumbers, eggplant, myōga (ginger buds), okra, and shiso. Nattō kombu, finely minced dried kombu, is another key ingredient. I picked up this pack of nattō kombu なっとう昆布 or 納豆昆布 at the Yamagata antenna shop in Ginza. Soak a small amount of the nattō kombu in water while prepping the vegetables. I like to blanch the okra and remove the seeds, but if you are in a hurry or don’t want to be bothered with turning on the stove, you could mince the okra while raw. Finely chop the cucumbers, eggplant, and okra. Mince the myōga and shiso. Combine all of the ingredients in a bowl and season with either soy sauce or tsuyu (seasoned soy sauce used for soba or udon noodles). Serve over rice. If you can’t be bothered cooking rice, use the precooked rice that only needs to be microwaved. Serve immediately. Best to make only what you can eat as the texture changes if it sits overnight in the refrigerator. Do let me know if you try making this dish. Curious what your reactions are. Kozue at the Park Hyatt Tokyo is a lovely spot for Japanese cuisine. At lunch if the skies are clear you have a gorgeous view of Mount Fuji. At night the city twinkles below you. Two years ago Kozue did a special Tohoku menu to show their support for three prefectures that were hit hard by the earthquake and tsunami, Fukshima, Miyagi, and Iwate. This year Kozue is repeating the Tohoku Heroes menu, but moving on to the other three prefectures, Aomori, Akita, and Yamagata. Chef Kenichiro Ooe is from Yamagata, as is my family, so we share this connection with Tohoku. 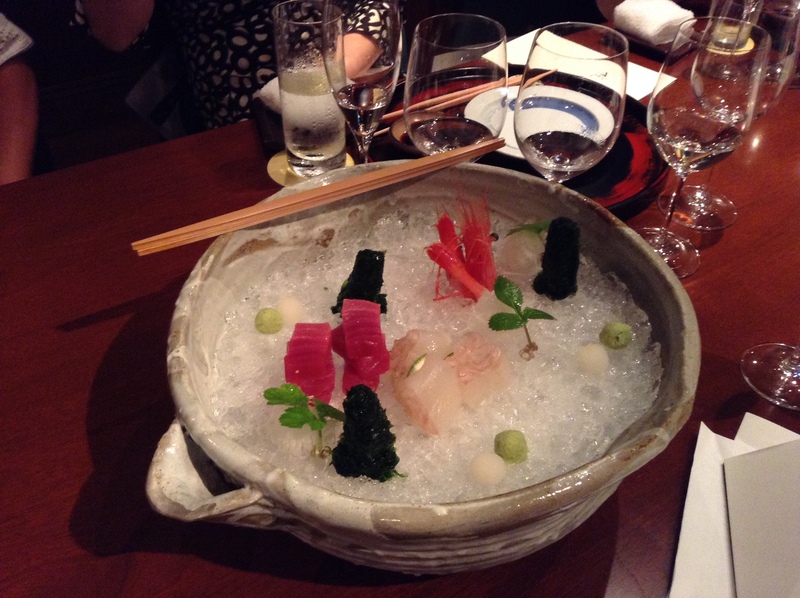 At a recent dinner at Kozue chef Ooe introduced many products and sake from Tohoku. Koji Nishizaki, the manager of Kozue, gave lovely commentary on the sake with each course. 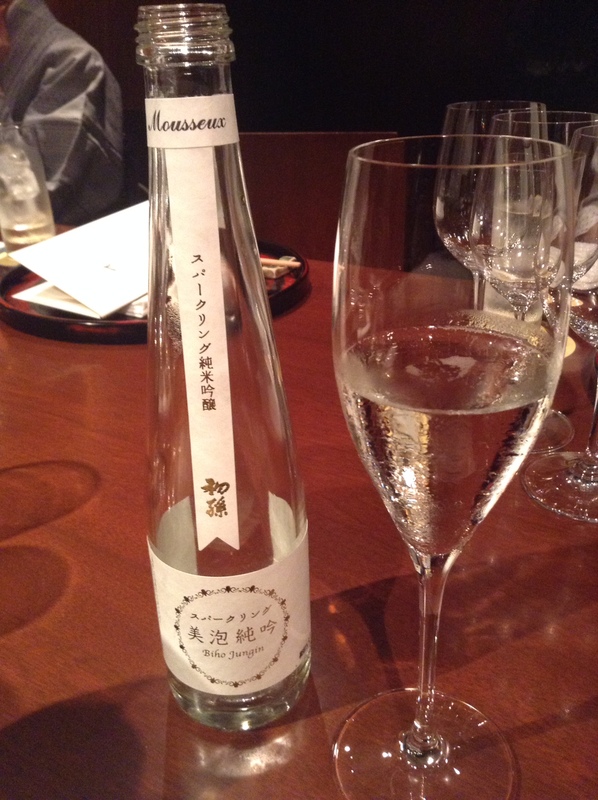 We started the evening off with a sparkling sake from Hatsumago. Hatsumago is a lovely brewery from Sakata in Yamagata. I sold many bottles of Hatsumago when I worked at Takashimaya. It means the first grandchild. A lovely gift for new grandparents. It is only 10% in alcohol, so light on the palate and refreshing. A great start to any evening. Hiraizumi Marubi 15, Yamahai Junmai, Akita Miyama-nishiki rice. 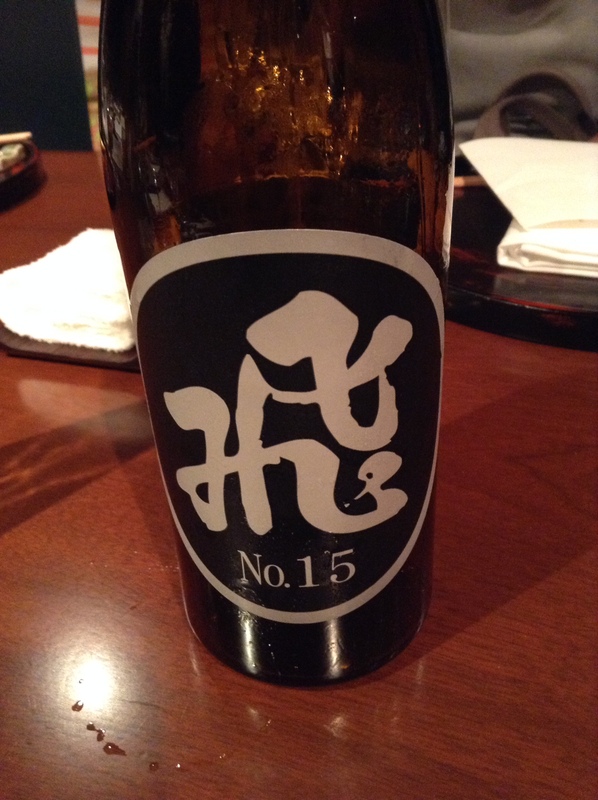 The yeast that is used for this sake is called Akita kobo #15, where the sake gets its name. 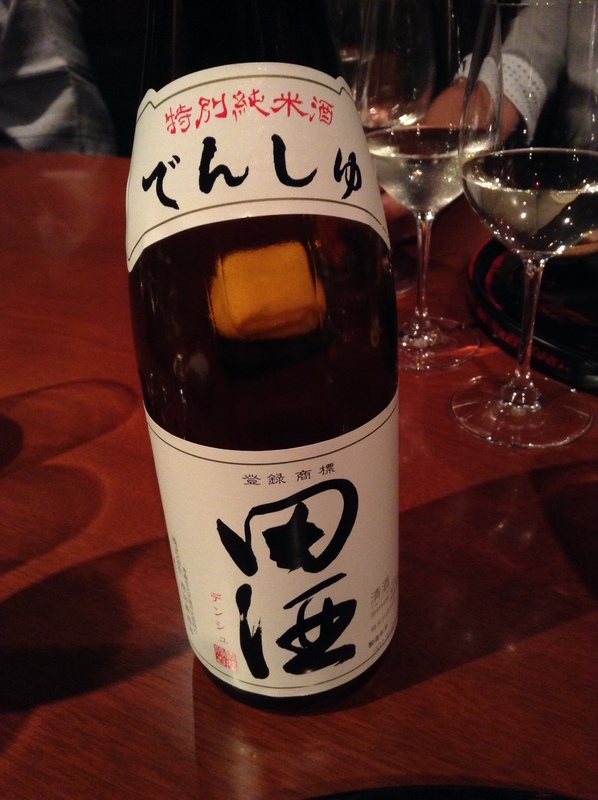 Although it is a yamahai sake, it is not too heavy as yamahai can be. A very food friendly sake. Chef Ooe talked about visiting the Tohoku region to meet the farmers, ranchers, and fishermen behind many of the products that they are using. For example, the watarigani crab used in this starter has a local name of gazami. I love these local colloquialism regarding food. It seems to be especially prevalent with seafood. 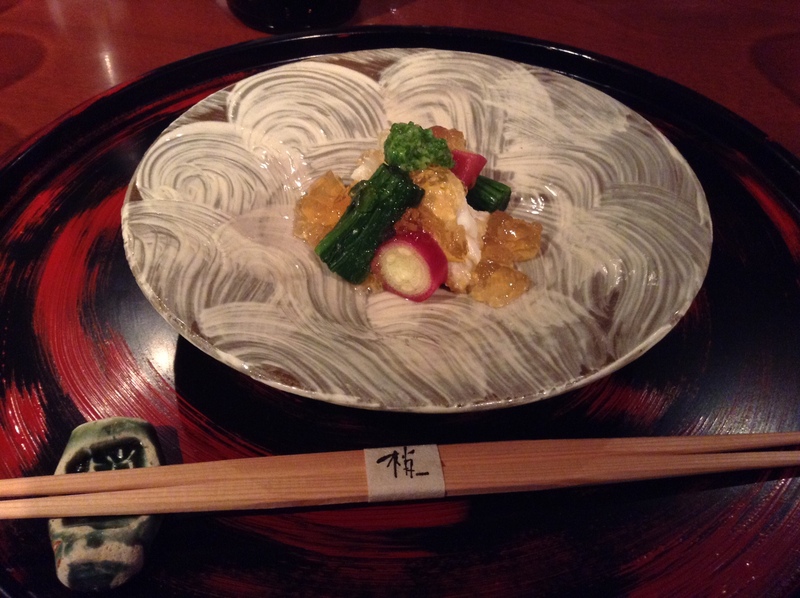 The crab is steamed in sake, spinach, myoga, and Tosa-zu jelly. Tosa-zu is a classic tart dressing made with rice vinegar, soy sauce, mirin, and dashi. As a jelly it adds a nice texture to the dish. The Hatsumago sparkling paired well with the Tosa-zu jelly, myoga, and crab. Underneath is some kani-miso, or the offal of the crab, a delicacy and an unexpected and nice surprise. 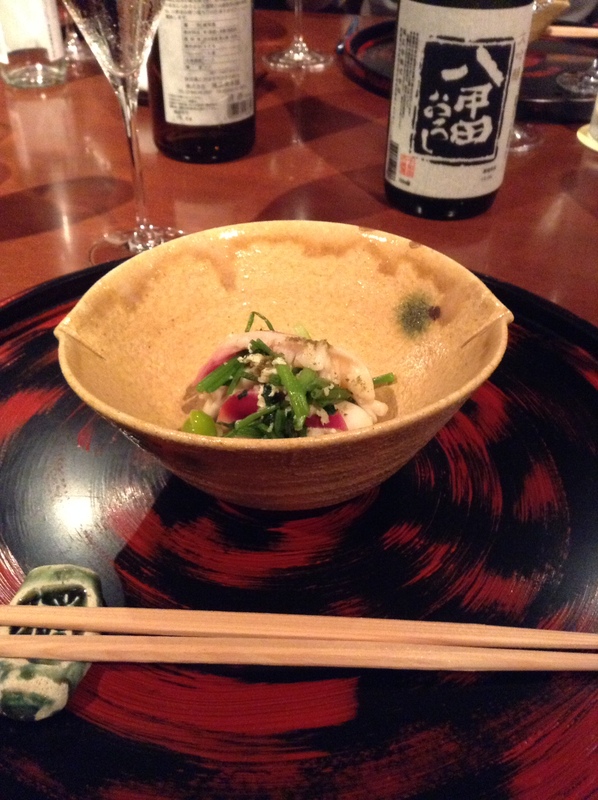 The rich kani-miso was rich and paired well with the Hiraizumi Yamahai Junmai. Warm Aomori hokkigai appetizer with seri, maitake mushrooms, ginko nuts, and sansho was served with Hakkoda Oroshi Daiginjo. 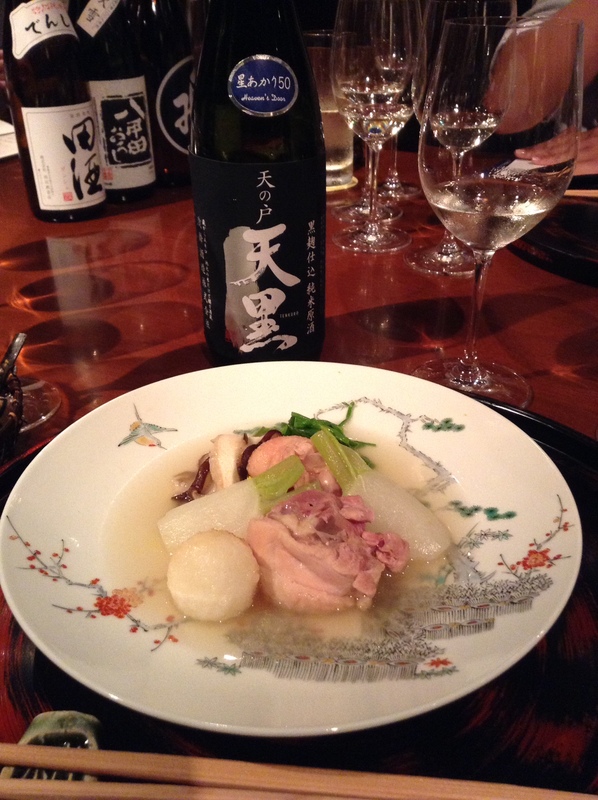 Both the hokkigai clam and sake are from Aomori, so a natural partner. I also love this dish with the accent on both edges of the bowl. Dining at Kozue is also a delight on the eyes. Each time I am here I come across new tableware that capture my attention. 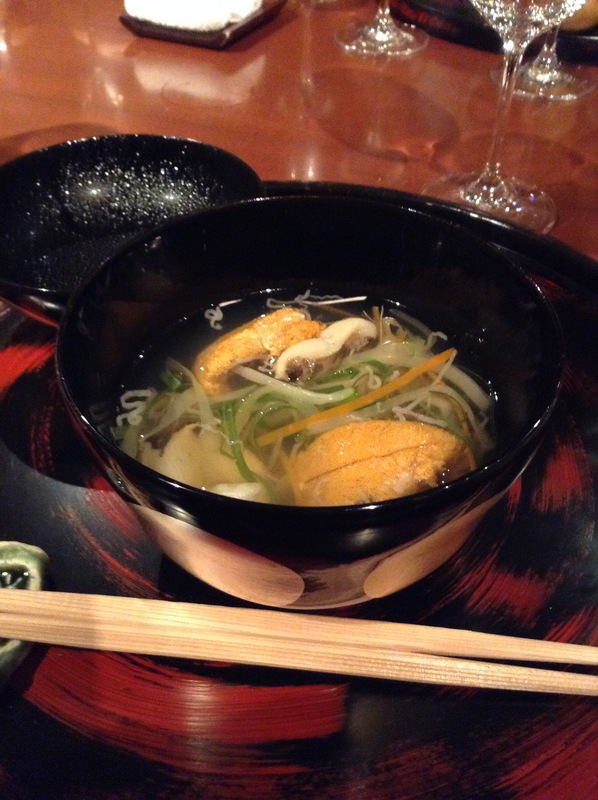 The Japanese eat with their eyes and taking in the vessels are part of the pleasure of dining at Kozue. Owan soup bowl. 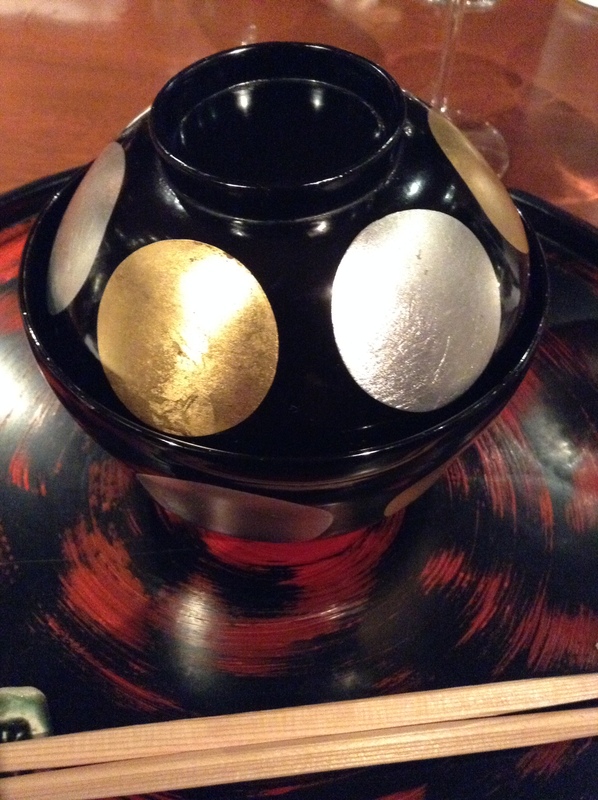 Check out this lovely lacquer bowl with silver and gold circles. My neighbor at the dinner, a Japanese travel writer, said, “it is September”, like I should know why this bowl is being used this time of year. Of course, the harvest moon. So here you also get an appreciation that chef Ooe selected this bowl for this dish due to the time of year. The owan soup course is a famous local dish called ichigoni of awabi and uni. I’ve tried it in the past and have never liked it, until now. Chef Ooe’s soup was rich in umami and the seafood was pristine. It didn’t hurt that there was matsutake mushrooms and other vegetables in the soup. Chef Ooe sashimi presentation always has a big impact. How gorgeous is this large katakuchi bowl filled with crushed ice? This is a serving for three guests. Mimmaya bluefin tuna, makogarei, and amaebi. The fresh nori is always a treat. Chef Ooe commented that it is still early in the season and that the tuna was not as fatty as it will be later in the season as the water cools down. Amanoto made with kuro koji from Akita. This was my favorite of the night. I wonder if it is because of the black koji – as I am a fan of Okinawa awamori spirit, which is also made with kuro koji. It was served with a Hinai jidori chicken from Akita and included a kiritampo rice ball, a classic dish from Akita. It was nice to see it elevated to this level, as it is a dish often made at home. I think this dish that this was presented in was my favorite of the night. Sadly I had to leave the dinner, unexpectedly, and missed out on the Yamagata Yonezawa wagyu and the Yamagata soba. Dessert was a rice ice cream. I did love being introduced to new sake, a renewed appreciation for Tohoku ingredients, and seeing new vessels. If you go, I highly recommend asking to have Tohoku sake paired with your meal. If you are looking for jizake or shochu from a small producer or an artisanal miso the first place to check out are the antenna shops. Markets that specialize in regional products, usually from a specific prefecture. The Okinawa antenna shop in Ginza has a huge selection of awamori and the Miyazaki antenna shop in Shinjuku brings in a limited amount of premium shochu on the first of each month. Seafood, meat, and fresh produce as well are often sold. Some of the shops will have a restaurant or an eat-in corner. The Yamagata antenna shop has a branch of it’s famous Italian restaurant using Yamagata products. Here is a list of antenna shops in Ginza, the area with the most number of shops. Here is a list of antenna shops in Nihonbashi. Over 600 items and an eat-in corner with takoyaki and butaman. Sanuki udon, somen, Tokushima ramen, sudachi, jizake, and more. Tako no kamaage, oden packs, Higashimaru udon, vegetables, and more. Over 800 items including masu sushi. Over 50 types of umeboshi, jizake, and fruit. Over 1,500 items, including a Koiwa soft cream corner. Produce, sweets, and jizake with an event space on the 2nd floor. Jizake, fruits, vegetables, and an Italian restaurant incorporating Yamagata’s produce by star chef Masayuki Okuda at San Dan Delo. Chuo-ku, Ginza 1-5-10, Ginza First Five Bldg. Hiroshima-style okonomiyaki sauce, popular momiji maple leaf sweet buns, oysters (frozen or in oil), Yukari red shiso furikake and two eat-in restaurants. 2nd floor for Hiroshima-style okonomiyaki and 1st floor for shiru-nashi ramen, a style popular in Hiroshima and harder to find in Tokyo. A large selection of shochu, restaurant, and much more. Rakkyo, nagaimo, seafood, Italian restaurant featuring Tottori products, and more than 1,500 items. Minato-ku, Shinbashi 2-19-4 SNT Bldg. Fruits and vegetable, seafood products, and more than 1,000 items. ASOBI Bar on the 2nd floor featuring Kumamoto shochu, basashi (horsemeat sashimi), and karashi renkon. Sweets, jizake, and a restaurant on the 2nd floor. An impressive selection of awamori in the basement and fresh produce such as go-ya. Chuo-ku, Ginza 1-3-9, Maruito Ginza Bldg.